The Legendary 99.9% Pure Silver Angel Coin. As Seen on TV! For over 600 years, silver and gold coins featuring Angels have been treasured by millions. Medieval kings and queens often bestowed Angel coins on worthy subjects, and these coveted coins were believed by many to bring the bearer good luck, fortune, and were even thought to have cured sickness and save lives. As treasured touchstones, of good fortune and health, Angel coins were often passed down through generations as a family legacy. The famous French coin designer, Augustine Dupré, was appointed by King Louis XVI to design an early version of a Gold Angel coin in the 1790's. While he initially enjoyed the King's favor, the French Revolution began to brew and Dupré suddenly found himself sentenced to death at the hands of the guillotine. As legend has it, Dupré stood before the guillotine to be executed one stormy day and he pulled one of his Angel coins out of his pocket and rubbed it for good luck. At that moment, a bolt of lightning struck—causing his execution to be postponed. Before it could be rescheduled, Augustin Dupré was granted a pardon. For the rest of his life, he proclaimed that it was the lucky Angel coin which has literally saved his neck! From this incredible tale of salvation, the legend of the lucky Angel coin has grown and grown for centuries. Napoleon, King Henry VII, fighter pilots, seafarers, and rescue and police heroes have all proclaimed the Angel's powers of luck and protection. In 1984, a new Angel series was established by the Isle of Man. This British island nation commissioned the world renowned Pobjoy Mint in London to strike the modern Angel coin series. 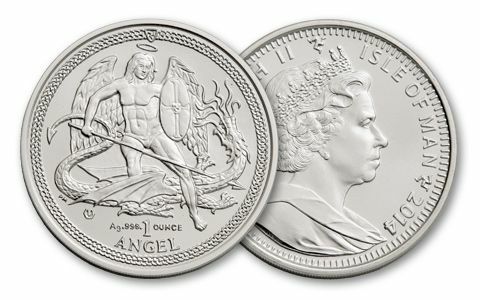 The Pobjoy Mint is one of the oldest and most respected private mints in the world, and the design that they created for the Angel series immediately garnered a Coin of the Year award in its very first year. Since 1984, an exciting array of Angel coins have been struck in Gold, Silver, Palladium, and Platinum. The Angel series has become one of the most popular collector coin series in the entire world. Unlike mere tokens of good luck, these coins are official legal tender and are struck in pure precious metal. 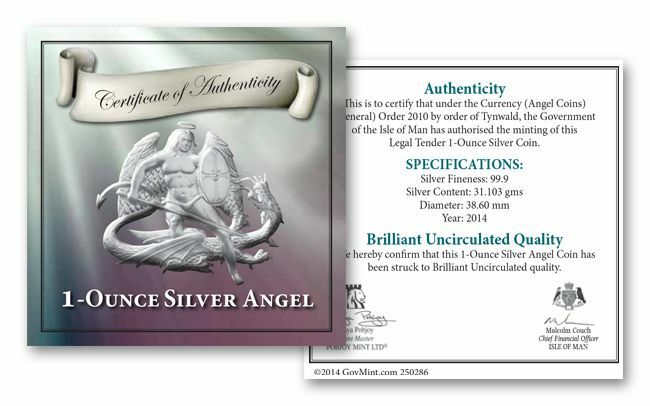 Now, for the first time ever, the Pobjoy Mint has issued a one Troy ounce Silver Angel struck in 99.9% pure silver in Brilliant Uncirculated (BU) condition. The coin's reverse features a dramatically-sculpted image of St. Michael the Archangel battling a fierce dragon. This classic depiction of the triumph of Good over Evil appeared on the very first Pobjoy Angel coin in 1984, and was awarded the prestigious "Coin of the Year Award" for excellence. The obverse of this coin features the regal portrait of Her Majesty Queen Elizabeth II. 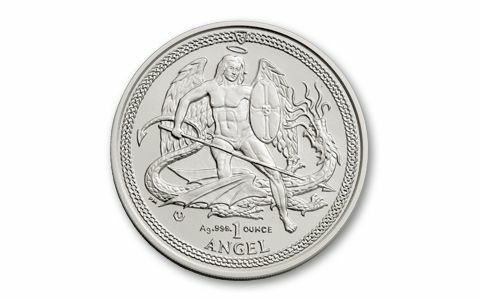 In addition to the St. Michael & the Dragon design, the coin's reverse also features the denomination of "1 Angel", the purity of "Ag.999" (99.9% pure silver), and the weight of 1 ounce. 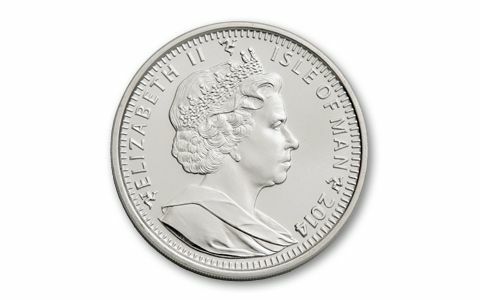 The Queen's portrait side of the coin features the legend "Queen Elizabeth II", the year date 2014, and the country of issue "Isle of Man' – which is an island nation located within the British Isles between England and Ireland. 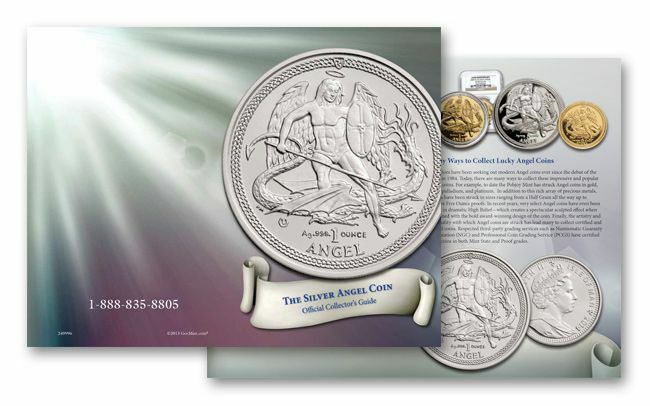 Each spectacular Brilliant Uncirculated 2014 Silver Angel comes with an official Certificate of Authenticity, as well as a colorful and informative Silver Angel Collector's Guide containing more information about the Angel coin series and its lore and legend. Buy several as these make great gifts!